Rich Farm Ice Cream opened for business on July 3, 1994 by David and Dawn Rich on what is known as Ajello’s Farm. 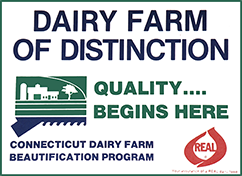 The dairy farm was originated five generations ago by Dave’s great-grandfather, Raffaele Ajello, on Great Hill in Seymour, Connecticut. In 1950, Ralph’s don Thomas purchased 100 acres in Oxford and moved his farm there. Later, in the early ’70s, grandsons Don and Dave Rich took over the dairy business and continue to operate the farm today. The ice cream shop was opened by Dave and his wife Dawn, along with their children, to enhance their already existing dairy farm. All of the ice cream is made daily on the farm, using only the highest quality ingredients.